Our famous fruit and veggie muffins recipe! These are the perfect back up plan when you have those days where your picky eater just won’t eat anything! 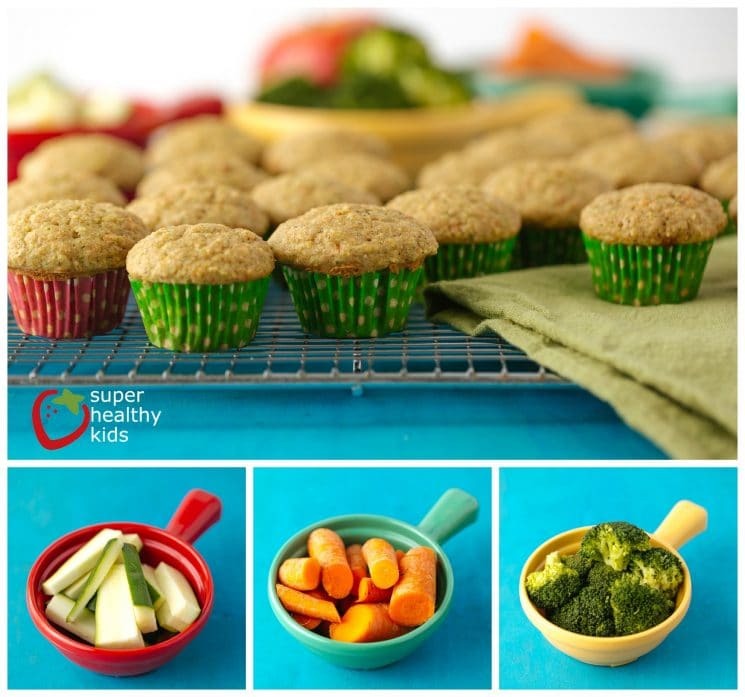 Packed with fruits, veggies (like broccoli, zucchini, and carrots) and whole grains, you can be sure your little one gets a whole lot of nutrition in one little muffin! Almost every day we get a parent that writes to us about their picky eater. As a parent, sometimes getting your child to eat anything, let alone eat healthy can be very stressful! While I am a big proponent of teaching your children to love healthy food, especially fruits and vegetables, sometimes you have to have a backup plan. Today our backup plan is these fruit and veggie muffins. They are packed to the max with fruits and vegetables, protein and whole grains. A lot of times, the way a food is presented or ‘packaged’ can influence if your child wants to eat it or not. When I made these muffins, I told my girls they were princess cupcakes. The rest is history. They each downed one hot out of the oven because they couldn’t wait to try a princess cupcake. 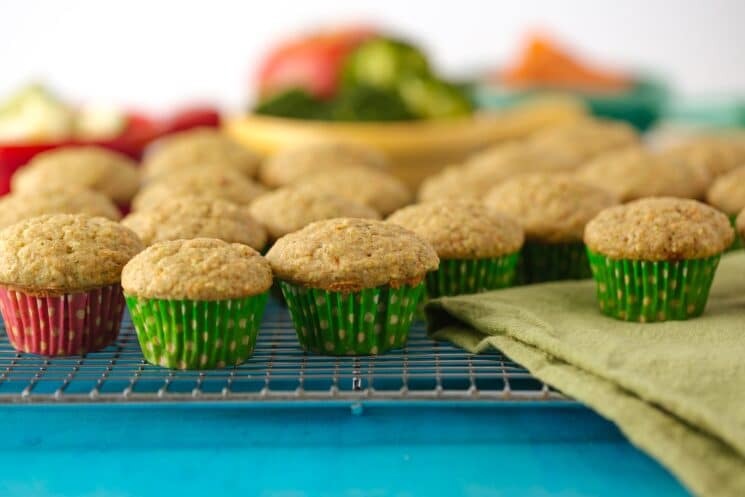 You might think with as many fruit and veggies in these muffins that there is no way on Earth they could taste good! Even when I was mixing up the batter I was still a little skeptical, and the batter does look a little crazy. However, these muffins are out of this world delicious! They have a buttery sweet flavor and are super moist. My kids help me make them and know exactly what is in them, but don’t mind at all because they taste so good. A lot of times kids don’t like fruits and veggies because of texture and not necessarily flavor. All of the fruits and veggies in these muffins are chopped so fine that the texture isn’t an issue! Whenever I make these, I always make regular size muffins as well as mini muffins. My older kids like to eat the regular size muffins, but for my littles the mini muffins are the perfect size! These freeze really well, and are great reheated with just 30 seconds in the microwave. Make sure you use the fruits and veggies that are included in this recipe. I know there are lots of other fruits and vegetables out there that would be delicious in this recipe, but I have not tested them and so I don’t really know how they react in the recipe. The moisture content of the fruits and vegetables will make a difference as to how well the muffin will cook. If you are making regular size muffins, don’t use muffin liners, just bake directly in your muffin tin. If you bake with a liner, it takes a lot longer baking time, and even then the bottom still sometimes ends up a bit wet. Only fill your muffin tins 3/4 of the way full. Make sure your broccoli and zucchini are steamed. You will want the zucchini you use to be on the smaller size – the larger size zucchini have a lot more water and this recipe doesn’t take that into account. 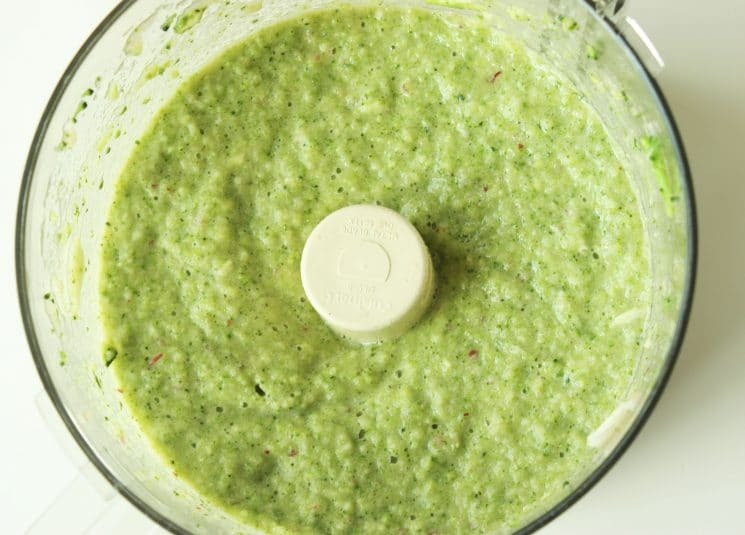 When you blend all of the produce together, it will look slightly like baby food, or pesto……don’t be scared. If you don’t like carrot shreds in your muffins then blend the carrots with everything else. My kids love carrots and so I didn’t feel the need to puree them. Plus I think shredded carrots look so pretty in a muffin. I grated them with a fine grate and put them in after everything had blended. These fruit and veggie muffins have all of the elements to basically be a complete meal! Veggies: broccoli, zucchini and carrots. Fruit: banana and apple. Grains: Whole wheat flour. Protein: Greek yogurt. And lots of vitamins and minerals! And let’s not forget fiber – these little muffins are packed with it! If your kids need a boost, then this is the recipe you will want to make for them! Combine the fruit and veggie puree, carrots (unless you already added them with the puree), and yogurt, into the wet ingredient mixture (sugar/butter/eggs) and beat until mixed. It’s official, I need a food processor! These muffins are awesome. hi very nice muffin , but what can a do if i don’t use egg? I followed recipe only adding coco powder. However they are falling and not risings?? Advise please. What type of muffin pan did you use to get the tall skinny muffins? So cute! Wow, these look great. I’m so impressed with the amount of fruits and veggies in these! Caryn – The tall muffin pan is from Ikea. I love it. The only veggie I steam was the broccoli – I used leftover broccoli that I had already steamed. Since the carrots are shredded, they will cook in the muffin. And I used applesauce so no steaming for that! You can add the banana in with the food processor. Sounds yummy, any substitute for the sugar you can recommend?I am trying to eliminate as much sugar as I can from stuff I bake. Thanks! Love the site ! This is a great recipe. I have used all sorts of veggies in my muffins, but never before have I thought of broccoli. What a great way to deliver a super food. Also, even if your kids are great fruit and veg eaters, I always like recipes like this as a way to go a step further and get them extra in a snack too. Be careful not to add too much broccoli, I used broccoli, carrots, and pear sauce for my fruit veggie combination and the smell of cooked broccoli wafting off my muffin was just not appealing. The original recipe used less broccoli, so I wonder if you noticed the scent? I didn’t notice it at all. In fact, I barely noticed the broccoli in them! I made these this morning and they were a terrible disaster. They absolutely would not cook through! I cooked them way past the recommended time and the tops were starting to brown but the inside was still raw batter. Too much puree to dry ingredients maybe? I had the exact same issue. I made mine regular sized and i cooked them 15 minutes longer than the recommended time and they’re raw in the middle 🙁 . They’re still absolutely delicious though. Did you make regular size muffins? Yes I would bet the problem was too much puree. I made a really large batch with all of the puree that I made and so it probably evened out. Don’t give up – they really are delicious. Also you could try making mini muffins. Those worked out really well for me. Good luck! Can I use eggplant instead of the zucchini? I’m also wondering about decreasing/eliminating the sugar. Any suggestions? You can definitely try decreasing the sugar in this recipe. I have cut the sugar in a lot of muffin recipes by 1/2 and they have turned out fine. If you try it, let me know how they turn out! My kids loved these. I used less sugar then it called for and they were still great. These muffins were fabulous! Made them this morning and my 13 mos old LOVED them! My husband is very picky and he loved them, too- he can’t bear to let me freeze any! I followed the recipe exactly this time, but I am going to try decreasing the sugar by 1/2 in the next batch. I’ll let u know if it works. Thank you, for this wonderful recipe, I know I’ll be making them again! Leah – I’m so glad you all liked them!! Yes – definitely let me know how they turn out! Thanks so much! Love this muffins! I changed the zucchini for celery an added flaxseed and chia seeds and they turned out delish!!! Can’t thank you enough! Natalie, I also tried to make regular sized muffins and they didn’t cook in the middle. I think the temperature might be too high but I’m not a skilled enough baker to know what the best temp and time to use. I do not have a mini muffin pan to make these. Sorry they didn’t work out! 350-375 are very common baking temps for muffins. Because of the veggie puree, they definitely may need a longer cooking time though. And ovens do cook a little different. My oven tends to take a little longer than what most recipes state. Try 350 degrees, but you will probably have to bake them for 30 minutes. Let me know if it works out! A muffin tin and a cupcake tin would be one and the same. The mini muffin/cupcake tin makes really small ones. What a great recipe!!! I just made made my second batch as the first batch was a flop because they wouldn’t cook all the way thru. The reason the first batch did that is because the veg/ fruit purée was too liquidy as I had used too much apple juice. Try making the purée thicker and they will turn out muuuuch better:) also mini muffins is the way to go. Hope this helps! Amy – thanks for the suggestions! These are amazing!!! Thank you for a fantastic recipe! We LOVE them! My 2.5 year old has had two since they cooled. (in a matter of 10 min!) I made an pear/apple sauce and added that instead of apple sauce. I omitted the yogurt and added 1/4 cup more of the pear/apple sauce, cut the sugar in half and used all wheat flour. I work for a non-profit Common Threads as a Chef Instructor teaching after school cooking classes to children 8-11 and very passionate about healthy foods. Your website is fantastic and I’m so glad I found it! Keep up the amazing job and thank you for sharing your wonderful recipes!! I have made a lot of muffins trying to get fruits and veggies in my super picky children and these are by far the best! They both love them and they are packed with goodness. The only problem with taking the yogurt out is that you’re taking out some of the protein. I’d love to see a nutrition breakdown for these muffins. My son can’t eat dairy. Any suggestions for a substitute for the yogurt? Also, we don’t use sugar – has anyone tried this recipe with honey? Hi! Made these 2 days ago and turned out great! My supper picky 15month old ate it! How are they stored!? On counter or in fridge. I saw you wrote in freezer but then everytime you were to go to eat one you need to let it thaw out? You definitely don’t have to store them in the freezer. We just don’t eat them that fast. You can store them in the fridge or on your counter as well. They won’t last as long on the counter, but if you plan to eat them within a few days they should be fine. I just store them in the freezer and then when we want to eat one, pop it in the microwave for 30 seconds. Good luck! I’m picky when it comes to fruits and veggies. This seems like a good way to eat more veggies. Do you know the caloric values? The muffin pan is from Ikea. It is so cute! Thanks Emily! I checked out your blog post and your pear/apple sauce looked delicious! I made these today and they also took at least 45 mins to bake and still were very moist. I used steamed caulifloer, apples (they were very wet), applejuice and fresh brocoli (maybe my mistake)…they tasted too brocoli’y….my 4 year old and I threw away. I followed the recipe and can’t see how everyone loves them….any secrets I’m missing, don’t know if I’d try again or not. Made these today and we didn’t like. I didn’t steam the brocoli and used steamed cauliflower and apples, they took forever to bake, like 50 mins and tasted too much like brocoli. not good. any suggestions? 1)	Don’t use steamed cauliflower – use steamed broccoli – I only used about ½ cup of it. 2)	They turn out better as mini- muffins because they are smaller and take less time to bake. 3)	Follow the recipe as close as you can. I made them using the exact recipe on the site and they turned out delicious. Food processors are also great for making hummus, we have one that attaches to our blender base. If your blender is strong enough, then you can definitely use a blender. The only problem I can foresee is if it makes the puree too ‘liquidy’ from over-blending. I would try pulsing it to get it into a puree, and not completely blending it. Did you steam carrtos and zucchini? Or just the broccoli? I used spinach, peppers, cucumber, apple, banana, strawberries, carrots, and butternut squash. I left the carrots and strawberries to mix in after the purée was finished- shredded carrots and small pieces of strawberries. I just steamed the broccoli. Zucchini was raw and carrots were raw also. But I did shred the carrots pretty fine. Wow – interesting! Did the peppers and cucumber give it a different flavor? I have found that cucumbers have a surprisingly strong flavor. Glad they turned out for you! No, I didn’t find any flavour overpowering. I used only about 1/4 of an English cucumber bc that’s what I had, and maybe 1/2 of a small pepper total. I used green and orange bell peppers so nothing with huge flavour, but threw them in for the nutrition. The bulk of the mix was banana, squash, and spinach. They are quite tasty! Good to know. I will have to try a variety of fruits and veggies next time. Thanks for the tip! I made them today, they are delicious! I was wondering what kind of sugar do you normally use to cook for your kids? I used for this recipe pure cane .. But i was thinking what kind of sugar is better for my kid (he is almost 3)? Marcy – that is a great question! Our opinion at SHK is that all simple sugars — agave, sucrose, honey, maple syrup, raw sugar, molasses, brown sugar, corn syrup, turbinado sugar, etc should be reduced in your diet. While there is much controversy around this issue, your body processes these sugars much in the same way. Choose your favorite kind and use it sparingly! Thank you for your response, how about “sugars” like splenda? Splenda leads into an entirely different class of sweeteners known as ‘artificial sweeteners’. Splenda is the commercial name of sucralose which is derived from sucrose. It is not broken down by the body and so it does not provide any calories. It is 600 times sweeter than table sugar and so less is needed in comparison. Hope that answers your question! Yes thank you! and Is it a good idea to give my kids splenda instead of regular sugar? What do you think about this? I would not recommend giving your kids splenda as a replacement for other types of sweeteners. I would recommend trying to cut back on added sugars in general in your children’s diets. The best way to do this is by replacing processed foods with natural whole foods! If you do a lot of your own baking and cooking, it is almost always possible to decrease the sugar in recipes. Good luck! I got it.. Thank you! I was wanting to make these for my kids but I need to replace the Greek yogurt as my son is lactose intolerant could I use lactose free yogurt? or would something else be more suitable? 3) tofu – I would buy the soft kind. This is great! Hoping to try them this week for my picky eater. Any thoughts on making them gluten free? I also have to cut out the eggs…. so this may not work. You can use a gluten free baking mix and sub one-for-one for the flours. Also, my son is gluten, dairy and egg free so we use soy yogurt and for the egg I use 2 tbsp water, 1 tbsp olive oil and 2 tsp baking powder mixed for each egg. It works well for me. My son loves these!! I love these! Thanks so much. I used what I had on hand so my puree was different. I ended up with zucchini, carrot, banana, strawberries, and prune juice with the apple sauce. I used just under half a cup of sugar and omitted the salt. I was thinking about the comments regarding substitutes for the yogurt. If you didn’t want to use the yogurt, but still wanted some protein, I bet you could easily slip some white beans or chick peas into your puree instead. I can’t imagine it would affect the taste at all. I did not have trouble with the consistency. There are probably three reasons for that. 1. I did make mini muffins. 2. When I finished my puree it was only about 2- 2 1/4 cups, but I was so happy with it I didn’t want to risk messing around. So I used it as is. 3, I used my stick blender (immersion blender) instead of my food processor to make the puree. This might be a good idea for those that had issues with it being too loose. I had great control over the texture and added liquid a little at a time until it looked right. This would also allow you to phase in fruit/veggie pieces as your kids get used to them. Just thought it might help someone else. Reading over the ideas on not using yogurt (like a previous poster, it’d be for my personal preference as I’m just not fond of yogurt at all… though the kids are)… might a soft tofu work to replace it? Or if it is in there just for the protein, the white bean idea is decent, or an alternate flour that is higher in protein maybe? I would definitely try a soft Tofu. It would contribute to the texture and protein. Just tried these with Carrots, Apple and Zucchini and my daughter wasn’t sure at first but after she tried them she said she liked them. I didn’t tell her about the veggies in them just told her they were apple muffins. What can you add to the recipe other than the butter? Can this be replaced with applesauce? Thank you for this great recipe. 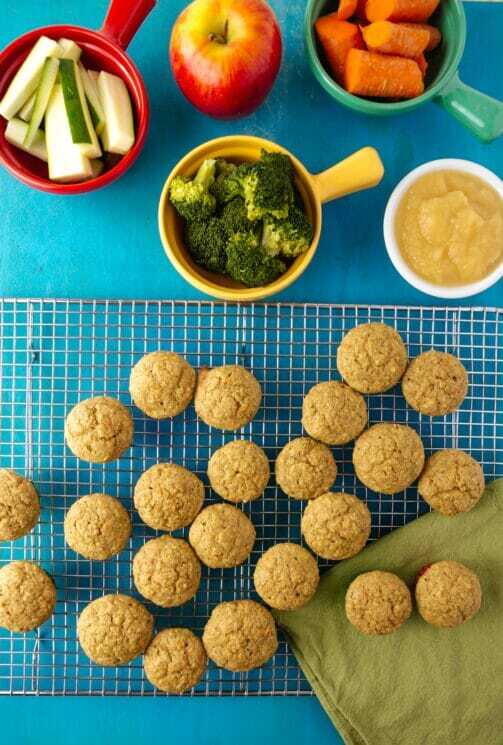 You can try applesauce, which is normally a great butter/oil replacement in muffins; however there is already applesauce in this recipe and so I’m not sure how it would turn out. You can also add mashed beans – some kind of white bean would probably be best – as a butter/oil substitute in muffins. Give it a try and let us know how it turns out! Beans? I wasn’t aware you could use those in place of a oil or butter wow I will have to try that. My very picky 2.5 year old doesnt eat ANYTHING!!! I made these, so far a few times, the puree with steamed brocolli, squash, cauliflower, apples and banannas. I made so much of the puree I froze 1/2 of it!! For yougart, I used the low fat organic bananna, to stick with the “theme” added some food coloring to make them purple, cakled them princess Aurora cupcakes and my kid has been going mad over them!! Tonight I am going to try to vary the recipie to make chocolate muffins… fingers crossed!!! This muffins must seriously be magic because so many picky eaters will eat them! Good luck with the chocolate muffins! Let me know how they turn out! I made these today, gluten free and also without the egg. I think I need to tweak them a little bit…but my picky 3.5 year old ate two without hesitation! My husband and I could taste/smell the broccoli a tiny bit…but obviously our son didn’t notice, or didn’t care 🙂 Thanks for posting! That is awesome. Sometimes kids are funny – they are picky when you don’t think they will be, and will eat other things that surprise you! I substituted the broccoli for kale. They turned out great! My kids gobbled them right up! Good idea – Kale is much more mild than broccoli and so would be a great substitution – thanks for the idea! I have some of the veggie puree left over. Do you think I could freeze it for the next batch? hi may i ask how much is 1 cup of flour for this recipe? My kids are allergic to dairy and egg whites. Any substitutions? I can use just the egg yolk but not sure if I could use soy milk and yogurt? You could try using soy yogurt, or if you wanted to replace the yogurt you could substitute a few things. The yogurt is mostly in the recipe for moisture so you can try: 1) a little more banana 2) more applesauce 3) tofu – I would buy the soft kind. Good luck! I just finally made them yesterday and used the soft tofu (I just don’t like yogurt and tend to taste it even where folks don’t think I will) and we used brocolli and Kale, butternut squash, banana and applies plus applesauce and carrots They are great, no taste of brocolli here. Ours was steamed but not so much it was mushy. Maybe that makes the difference? The 7 year old who helped and knew what was in them loved them. The 2 year old didn’t taste, maybe one day when she’s in a better eating mood. She’s a funny one though, she’ll turn cake down sometimes. You can use almond ‘yogurt’..I use the vanilla flavour and it is excellent. You can also use soy yogurt but I think the almond has more flavour and is less processed. I make these at least once a month.. I use fresh as well as frozen fruits and veggies.. this last batch used spinach ,zucchini, parsnips, carrots, raspberries, blackberries,pineapple,apple & mango! I just puree whatever I have on hand and use 2 1/2 cups of it.. Thanks for the feedback and fruit/veggie variety ideas! I just made these on Monday and I followed the recipe almost exactly (I only added a hint more cinnamon and had to add more applesauce b/c I didn’t quite have 2.5 cups of puree). I did mini muffins at 350 degrees and had similar issues as those posted above with a tiny bit of the center refusing to cook. I had to cook them for much longer to cook through fully, resulting in the outsides and bottom becoming a bit crispy. The second issue arose when I tried to take off the paper wrappers and the paper rips, leaving the outsides coated in paper. I wind up losing half the mini-muffin b/c I have to cut off all of the edges to remove the paper. Now, my children enjoy them, although they are a bit dry so I would really love suggestions on how to avoid this problem. Use less puree? Avoid the paper? Less applesauce? My suggestion would be yes, use less applesauce or puree. It sounds like for whatever reason your muffin is just too wet. Also you can try baking at 375 for a few minutes less and see if that helps. As far as the muffin sticking, I didn’t seem to have that problem, but they actually make a muffin liner that has a parchment paper type material lining the paper for this very problem. I found some on Amazon and added a link above to the post. Good luck! I just made these tonight and I am having the same problems with them not cooking through! I thought I could use any fruit or veggie for the puree as long as it equaled 2.5 cups. I just threw in anything I had in my fridge. Peppers, banana, apples, carrots, spinach, and avocado. I also added apple juice and apple sauce. The batter didn’t seem overly liquidy at all. It was the consistency of a thick pancake mix when I put it in the pan. I tried baking for an HOUR and they still wouldn’t cook through. I had to throw them away 🙁 Super bummed, these look delicious, Natalie! So i tried to make this muffin today, and while the batter tasted delish (i followed the recipe almost to a T); i had similar problems as noted above: (1) center didn’t cook (i don’t have mini muffin tins, so i used reg) and (2) the batter stuck to the muffin liner?! What temp do you recommend for reg muffin tins and should i spray the liners first? Thankyou so much fr this wonderful recipe which my kids love! My kids do not eat ANY fruit nd vegetables bu love these. Thank you. I am not into this kind of thing (myself) at all, as far as me eating it. I made these for my son (18 months old) tho because he needs all that extra stuff that he won’t taste. I just want to tell you about these disgusting (yet delicious) muffins I made. Disgusting to me but my son eats 3 in a sitting and THAT’S what counts! I used blueberry yogurt. Not as much as it called for, but what I had available. A little butternut squash. I also used soup lol. Yes, soup. I had all this butternut squash soup that was going to get thrown away. I used apples&more butternut squash soup for my applesauce. Yes, I was just going w/whatever. I put strawberry and kiwi in too. They came out really spongy and mushy on the inside (no doubt because of too much liquid). I also added the apple juice. Hey, I never claimed to be an awesome cook! I was all ready to throw them away, but I figured he’d at least try them. He won’t stop asking for them now! SO GROSS! But so good to him! Thanks tons for this recipe. It will be a go-to from now on. Another plus for too much liquid is the fact that they don’t crumble everywhere so I don’t mind him walking around the house w/one in his hand! me too! I think it was too much liquid somehow! owell! I know you’re probably sick of this question, but… I’ve attempted these twice with no luck. I use squash, sweet potato, zucchini, broccoli, carrots, banana, and apple, along withy the rest of the ingredients. The muffins never cook all the way through. I’ve tried adjusting the time and temp with no luck. I think maybe there is too much moisture in the squash and/or sweet potato. I really don’t want to omit anything I add because they are really delicious. QUESTION…Is there anything I can add to the recipe to fix the moisture issue? Follow this recipe. I know there are lots of other fruits and vegetables out there that would be delicious in this recipe, but I have not tried them. The moisture content of the fruits and vegetables will make a difference as to how well the muffin will cook. 2) Make mini-muffins. If you are having problems with the regular size muffins not cooking through, the mini muffins will for sure cook through! 3) If your muffins are sticking to your liners, try parchment liners (pictured at the bottom of this post) or try spraying your liners. Thank you, Natalie! I’m excited to give it a try. Fingers crossed! I’m not giving up until it comes together because I just can’t wait to feed these to my daughter. Thank you again! How do you eat them after freezing? Do you take them straight from freezer to microwave? I thaw them and then cut it in half (as mine wasn’t cooked enough in the middle, so it’s a little gooey) and toast it. It crunches it up a little. I just take one out at a time because I never know if my little one will actually want it! Yes – I take the frozen muffin and heat in the microwave for 20-30 seconds depending on how big the muffin is and how powerful your microwave is. I tried the recipe again but I altered a few things. I used agave nectar instead of sugar (and based on recommendations, only did 1/2 cup of it) and I was really worried because of how liquid the egg/sugar mix was given how wet the muffins were the last time. My yogurt was only a 6 oz serving, not an 8 oz as well. So for the puree I only added the smallest splash of apple juice and skipped the applesauce entirely. I did this because I also pureed the carrots, creating more liquid (and threw a few blueberries in there too, but not many). It only made 2 cups of puree and just used those. I also added a few tablespoons of ground flaxseed and about 1/4 cup of chia seeds to the dry mix, plus 1/2 teaspoon of baking powder. The batter was still very wet, but near as much as the first time. I used mini parchment baking cups I bought off of Amazon this time and didn’t even attempt to make any large size. They were still a bit wet in the middle, especially if I did two trays in the oven at once (this seems to affect the cooking time significantly, but I don’t like allowing the batter to sit long enough to do a single tray). I had to cook them closer to 25 minutes and was afraid the centers would still be too raw. It ended up just perfect, especially the trays that cooked alone. My picky 3.5 year old who won’t touch a vegetable will devour them. They made 48 mini muffins (I probably could’ve squeezed one more, but wasn’t going to due to pan size). And the parchment paper worked perfectly and they didn’t stick at all. Just be safe, after they cooled, I took the paper off all of the muffins before freezing them. It’s summer in Texas so if we’re going to be outside for a while, I can just grab them from the freezer before we leave and the mini muffin is thawed within 2 hours. Otherwise I pop them in the microwave for about 20 seconds. I think the wetness of the ingredients could be lowered even more and I think the baking powder helped them puff up a bit more so they weren’t as dense. Forgot to add to my very long new comment: I did not add ANY butter. I substituted applesauce, another reason I was not worried to use less puree, because the butter/egg/sugar mix was extremely wet with applesauce/egg/agave versus butter/egg/sugar. I just got notification that at her preschool a child is very allergic to eggs, so my daughter can’t bring anything containing eggs in her lunch. Now I’m wondering if pumpkin would taste okay with the other ingredients to substitute for egg, or if something else would work. These are the parchment cups I used. Thanks to the amount, I won’t need any for a long time, but we do love our mini muffins. Thanks a bunch for sharing this with all people you really recognise what you’re talking about! Bookmarked. Please additionally discuss with my web site =). We may have a hyperlink alternate agreement among us! My son eats them frozen?! Second try and still no luck. I followed the recipe excactly and skipped the apple juice part. It was better than the first time i made but still watery inside. But my little one still enjoyed it(is it safe to eat?). I will try it one more time. If you were to use Stevia, be careful as it is very potent. I actually enjoy Xylithol but again, you need to test the quantities. Agave is quite high in fructose content..honey might be a better option…but again, with apple sauce, juice and carrots, you might not even need sugar. Once you’ve reduced sugar in your diet, you tend to need less and less in your baking! Mine hasn’t gotten sick by the mushyness! It grosses me out, but he doesn’t mind. Loved these! Made them for my kids and I added a few chocolate chips to make it fun! They gobbled them up! Definitely will make them again. Baking time was quite a bit longer than recommended in the mini muffin tin. I also added 1/2 the sugar, used vanilla yogurt, added 1/4 cup wheat germ and white bean puree…gotta stick them in where I can!!! Hmm – not sure what went wrong. I am going to experiment with these since a lot of people have had problems. Hey All! I may have stumbled upon a solution to the gooey center issue. One day while I was making these I ended up with way too many chopped veggies but didn’t want to make a double batch (thank goodness because they wouldn’t cook through again). So I put the extra chopped veggies in the fridge and forgot about them for a few days. When I finally decided to try the muffins again I noticed that my veggies were a little DRY. Then a lightbulb came on in my head! My veggies were DRY! Hence less moisture in the batter! I also followed Natalie’s advice: “decrease the yogurt – only add 1/4 cup. Also decrease the apple juice to 1/8 cup.” Finally, my muffins came out perfect! FYI I use sweet potatoes, zucchini, carrots, broccoli, squash, banana, and apple. I also made the mini muffins. I haven’t tried this again so maybe it was a fluke but I would urge anyone willing to try it out. These really are delicious! Did you only use the recommended 2.5 cups of veggie/fruit puree? The first time I made them…I accidentally added all of my puree & I had the same problem. Soo good!!! I followed the recipe, used a mini muffin tin and they are just perfectly delicious. My daughter loves them. I am thinking about adding bran to these – how much do you suggest I add? Should I replace some dry ingredients with the bran? This may be a silly question but what do I do to make these gluten free? The bran wouldn’t be gluten free. Laura – I’m so glad they worked out for you! Honestly I am not sure how much bran you would add – but I would love to experiment with it. I don’t think I would replace it with dry ingredients though. In other bran muffins that I have made the bran is just an added ingredient. I am working on perfecting this recipe and if I add bran and it works out it will be in the new recipe! Thank you, I’ve recently been looking for info approximately this topic for ages and yours is the greatest I’ve found out till now. However, what about the conclusion? Are you positive about the source? can I use baby food puree’s in this because I have to find a use for all of the leftover. I frequently use dates as sweetener. You could add them to the fruit and veggie puree. I haven’t made this recipe yet so I am not sure how many too suggest. I personally would. I puree everything I put in there anyway. It probably will still be a bit gummy, but at the same time, with mine I just cut them in half and toasted them and it heated well enough for my son to eat them. I’m so sorry! That is seriously the worst. I honestly don’t know on these muffins – eggs are used as a raising agent and there has been a lot of problems with these muffins not being done in the middle. I’m sure you have discovered the answer a long time ago and I really hope they turned out for you! I used LOTS of strawberries, some broccoli, some banana, apple/sweet potato yogurt and green bean puree for the veggie/fruit part. Did not use any apple juice or other liquid. My child goes thru phases where he doesn’t want specific things, so I don’t know if he just thinks these are gross or if he is over the muffin thing for the time being. I usually only give him half of the muffin anyway. He will generally eat half and then doesn’t want the other half. But just thought I’d mention that those ingredients do work to make it cook thru. I just made some and they still didn’t rise that great, but they were cooked in the middle. For my fruit and veggies, I used lots of strawberries (probably mostly strawberries), half of a banana, green bean puree and broccoli puree. Also used apple/sweet potato yogurt. Didn’t use any apple juice. Everything else I did the same. I know, sounds gross. My (almost) 2 year old eats 1/2 a muffin at a time. He will eat half of this and then not eat the other half. BUT it could be that he’s not in the muffin stage right now. He does go thru phases of what he’s going to eat and not. Personally I think all these veggie muffins are gross, but if my child eats it, I don’t care! ” This is why a non loop LCD housing are different from any other outdoor television housing, some even have patents pending on their design and these units are installed in facilities such as prisons and mental health units. They always seem ready to jump to another level which we may be uncomfortable with at first, but later we find ourselves excited about the end result whether we admit it or not. After paying and having your profile approved, you may communicate with instant messages, email, chatrooms, message board forums, and e-cards. There are various appealing males to entice the female customers of grownup webcam web-sites. I just made these fabulous muffins. In my food processor I used kale, carrots, blueberries, bananas and apple along with some apple sauce and a splash of peach white grape juice . I substituted the cup of sugar for a 1/2 of brown sugar the put the mixture in mini muffin pans and baked for 20 minutes on 375. They were amazing and my 23 month old daughter loved them… Thanks so much for this recipe.. Its definitely a keeper!!! The muffins sure did make my day! My dgt and hubby ate 4 each. I get anxiety over my dgt’s picky eating. She is 3 year old and does not eat “any” fruit and will only eat broccoli. She loves her meat. I puree lots of veggies in my spaghetti sauce and taco meats. I will definitely have fun adding a variety of fruits/veggies to these muffins. Actually, our son has a hockey practice tonight and I’m bringing them along. Many thanks. Looking forward to making these within’ the next few days. My 1 year old has all of a sudden decided she doesn’t want ANY pureed food, but solids only…..however NOT veggies. So I need to get them into her somehow…….came across this recipe and can’t wait to try it out. Just wondering if you could substitute the apple juice for O.J.? You can substitute apple juice for any juice you want – it just depends on the flavor you want. I bet orange juice would be really good! Thank you SO much for this recipe!!! I made both the mini and regular size muffins. Followed your recipe to almost a T, and it was right on. I’m a decent cook but tend to fall short when baking. But with your great instructions they came out delicious. I’m very excited. This was a hit at my 2 year’s old birthday party. Even the adults liked them. Thanks! I’m a nanny and I was sick and tired of feeding those over processed, sugar-filled, not-in-any-way healthy muffins from the store. When I found this I thought it would be a great little activity for me and the 5 year old to do while the 18 month old slept. After sneakily pureeing all the veggies while he wasn’t looking, the little man helped me with the rest of the recipe. When they popped out of the oven they were green and initially he looked disgusted. Thinking fast I told him they were Hulk muffins and they would make him strong like the Hulk. BINGO! He ate like 5 that day. After that we limited him, but both him and his brother love them! I substituted broccoli for kale (which you kinda taste) and omitted all the sugar since both boys have enough extra energy in them to start with. Thanks so much for this! Would I be able to use Agave Syrup instead of the sugar or would that wreck the consistency? can i use flax eggs for egg allergic kids? My toddler can’t have bananas or dairy and since these only bake for 20 minutes, that’s not enough to ‘kill’ whatever bothers him. If I omit the bananas and yogurt, should I add more applesauce or pureed pears? I’m assuming I just need something sweet and bulky. Thanks. I am happy to say I just made these and they turned out perfectly! I used pumpkin, blueberries, spinach and kale mix, carrots and a banana and apple for my two and a half cups of purée. I omitted the apple juice and yogurt because I didn’t have any and I used almond extract instead of vanilla and they have amazing flavour. Cooked at 350 for 15 mins was perfect. Used mini muffin container and parchment cups. This will be my standard go to muffin recipe from now on! Thanks for the feedback! So glad they turned out for you. I just made these delicious sounding muffins and was so disappointed. I used the same ingredients as the recipe said except I used cranberry juice instead of apple. I made the mini muffins as suggested. They were so mushy inside. We will eat them so not to waste all those ingredients. I just made your recipe, using cauliflower, broccoli, carrot, banana, apple and half of miss 2’s unfinished pear. I didnt have cinnamon so i used a touch more vanilla and I used self raising flour as that is what I had nutelex and lactose free yoghurt. Well miss fussy 2 (lactose intolerent) is running around saying cakey over and over so they must be good. I was ?urious if you ever thought of c?anging the page layout of your ?ite? ?ontent so people could connect with it better. Youve g?t an awful lot of text f?r only having 1 or 2 ?icture?. Maybe you could space it out bette?? I am really impressed along with your writing skills as neatly as with the structure for your blog. I made these today and they turned out great! I am a terrible baker, and am so happy they turned out delicious. My extremely picky 3 year old who won’t let a vegetable cross his mouth, gobbled it up! My daughter doesn’t eat dairy either. I haven’t tried this recipe yet but I plan to this week. I am planning to use coconut milk yogurt, which she loves! Normally I give her raspberry, blueberry or vanilla coconut milk yogurt but I think I can get away with using the plain in this recipe. We also don’t use sugar. I was planning to try using shredded coconut. I’ll let you know how it turns out! Excellent Recipe! I pureed one cup of spinach, one banana and one cup of pumpkin puree for my veggies (I try to use one green and one yellow veggies). Son loves this muffin 🙂 I feel good knowing that he’s eating something healthy as a snack. I freeze the rest of my muffins in double freezer bag to prevent freezer burns and reheats it in the microwave. I’m planning on trying sweet potatoes and butternut squash next!!! What can I use to substitute the wheat flour, please. Need Gluten Free option. Any substitute for egg? My son is allergic to it. This are amazing! my toddler can’t stop asking for more! I doubt these will make it to the freezer because the whole family likes them so much! I used your recipe exactly but I used a pear instead of apple and pear juice instead of apple juice. I also used vanilla yogurt because that is what I had on hand and they were A.M.A.Z.I.N.G. We haven’t tested this recipe with GF flours, but we have a gluten free section on our site with other recipes! Good luck! We haven’t tested with substitutes for those, but we have a lot of recipes that are milk and egg free on our site. Good luck! Yay!!! So glad – this is why we do what we do! I just made these as mini muffins and they turned out great & are very yummy! I followed the recipe to a T except the the sugar….I added only a 1/4 cup and they were delish! I’m hoping my picky 18 month old son likes them as much as I do…we will find out tomorrow. Well, the muffins were a hit with my picky son & 4 year old daughter. Thanks again! Made these tonight and they are AWESOME!!! My 3 year old won’t go anywhere near a veggie, but he loves anything in muffin form. Can’t wait to experiment with different variations of fruits and veggies. I would definitely cut back on the sugar next time. Maybe leave it out completely! Thanks for the great recipe!!!! Should these be stored in the fridge because of the yogurt in them? They are awesome btw. My picky boys love them. I make them gluten free also. These muffins are fantastic, thanks for sharing the recipe. I just wanted to let you know that a friend suggested I add 1 tbsp of baking powder for full size muffins and they turned out perfectly. I also used lentils in the veggie purée and substituted some chia seeds, oats and oatmeal baby cereal (for the iron) for some of the flour. The muffins are awesome. Even my husband liked them, and my kids didn’t leave enough to freeze for later. These ruined my evening and wasted a lot of good fresh products. I did everything exactly as the recipe suggested, baked for more than 30 minutes, and the inside was wet and raw. Same happened to the next batch. I later saw a number of commenters mentioning the same problem. Sounds great…do you have to use whole wheat flour? We made these last night and they were FABULOUS! We used 3 bananas, 1 cup steamed broccoli and a whole zucchini–didn’t even need apple juice, sauce or apples. We baked for 17 minutes and they were perfect! My husband and I couldn’t stop snacking on them last night! I love your site and your recipes! Keep up the awesome work! If you are making regular size muffins you can try adding 1 tsp baking powder. And yes definitely only use the 2.5 cups puree – more will be way too much liquid. Where is the list of the amount of the ingredients? I need the list of the amount of each ingredient other than veggies and fruits. Thanks! I don’t normally leave a comment on recipes but this deserves one. These are delicious!! by far the best veggie muffin recipe I’ve come across to date. And my fussy toddler loves them! thank you! Thank you for the recipe! I have to be honest, I just used the veggie/fruit part and added to a basic sourdough muffin recipe because my toddler can’t have much gluten. I’ve found that true homemade sourdough is great for him! He has gotten more picky over the past few months, but these muffins are always a hit! He also can’t have eggs or dairy, so I use an egg replacer of 2T water, 1T olive oil and 2t baking powder for each egg. Won’t be trying these again or recommending them. After all the time I put into these they came out very moist, put them back in and now they are burnt and still too moist in the middle 🙁 The mini muffins did turn out but that’s too much work for me. I have been looking for a muffin recipe like this one for my toddler for ages. He is unfortunately allergic to eggs. Could you recommend a substitute for eggs? Chia seeds or flax seeds are good egg replacements in baking. I would recommend looking those up. These recipes are great as myself and my kids are very picky eaters! Where can I find the nutritional information for the recipes on the site? I too found these to be a disaster!! I loved the idea behind them as a way to cram some nutrition into my extremely restrictive Autistic son. No matter how long I bake them, they are an unappealing gluey, pasty texture. My guess is not nearly enough leavening agent to wet fruit / veg ratio. These are fabulous, not just because they are delicious and healthy and my kids love them, but because I was able to use up a whole bunch of random stuff in my fridge and freezer. I had some mashed bananas and cooked, mashed sweet potatoes (whenever I have extra, I nuke them, mash them and freeze them before they go bad for future uses like this) in my freezer and some zucchini, apple butter and low fat vanilla yogurt that needed using up in my fridge. I also threw in some shredded carrots. I reduced the sugar and skipped the cinnamon and Apple juice because I already had a lot of moisture and cinnamon-y sweetness from the Apple butter. I used the mini muffin tin and baked them for 15 minutes…they were PERFECT! The best part is, since I had enough of all of these ingredients, I went ahead and puréed enough for three more batches and froze the purée in individual freezer bags along with the instructions for finishing it off. Now, I can whip up some more with significantly less effort and cleanup. My husband works nights and will love nibbling on a couple of these to help keep him awake during the drive home. Win-win-win! These are fantastic. I used a quinoa/flax flour instead of whole wheat as that’s what I had on hand. I made mini-muffins and baked them on convection at 325 for 30mins. Also, only had an apple/sweet corn puree instead of apple sauce, so used that and was able to sneak in an extra vegetable! My 9 month old, my 2.5 year old, me and the hubby all loved them! Thank you. Thank your for the recipie! I personally have never found a veggie I like, so I am always looking for ways to sneak them in. They came out pretty good. I ended up using more Apple and half a banana. I also just used purée apples that I steamed and I used the apple water as the liquid. I’m in a high altitude location but I didn’t adjust the recipie any further. I baked for 25min at 350, that seemed to be the sweet spot for me. They smell like banana bread. 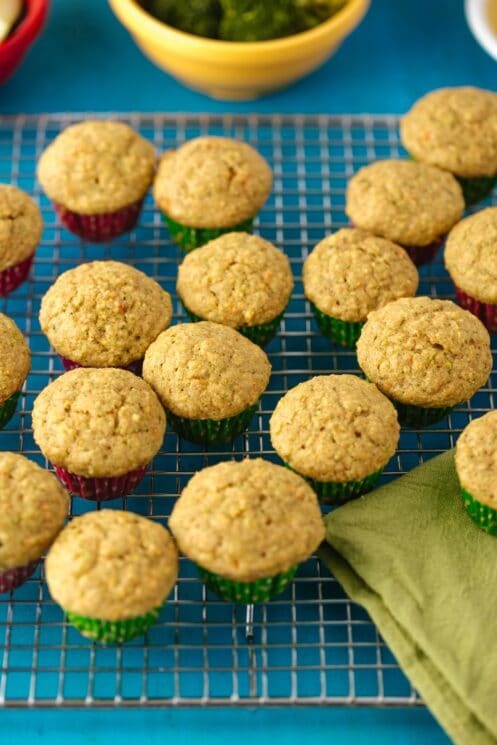 So, I just spent a ton of time with all the produce (apples, bananas, little broccoli, zucchini, carrots) and following the recipe step-by-step… (I replaced sugar with agave nectar and butter with coconut oil) but after 20 mins… they are not of a muffin consistency. They are very tasty but just thick puree consistency :-/. What a bummer. Wish I knew why. Someone on Facebook sent me this link. I’m an adult who just has never learned to like veggies. I like fruit smoothies but WOW this recipe is hard to make! But it looks so good! I think I overstuffed my steamer! And didn’t let it cook long enough! I used broccoli, Brussels spouts, cauliflower, blueberries and strawberries! You would not believe the heavenly smells coming from my kitchen! I used silicone mini muffin tins–sprayed with PAM. I packed each one–I think too much. An easy way to measure for a mini muffin is one tablespoon per muffin.nthis will allow room for expansion. While the muffins won’t rise a lot there is some rise. Honest I can’t wait to try these! Thank you so much for posting and making this available to someone like me who runs from veggies! I just made these (mini) muffins, they turned out really well with the fruit/veg combo I used. I used Zucchini, Carrots, Peaches and a Banana. I also used the unsweetened fruit/veg apple sauce thats flavoured of peach and carrot. I might put less sugar in the next time as it was a bit sweet but still very tasty. I just made the mini-muffins I used all the recommended veggies, no sugar and I added cut up raisins and they turned out great! I baked them at 375 for 30 minutes because they were a little wet still at 20 minutes. I baked them in silicone pans and they are definetely more savoury so I added cheese to the remainder of the batch and we will see how they turn out! Going to try this at home with adding some of the fresh fruits purees. Looking forward to trying these muffins! I notice under the ingredients list, it says nutrition information is based on 1 muffin. I can’t find any nutrition information? Have I missed it? Yes – they would be perfect! I followed this recipe EXACTLY using mini muffins, and they turned out great! My kids are super picky, and they devoured them! They love fruit, but won’t touch broccoli, carrots, or zucchini. I added all three, and they really are delicious. Thank you for the recipe. It will become a regular in my home. So glad! Thanks for the feedback. These were wonderful but…the first batch didn’t cook all the way through so I added about 1/2-2/3 cups more flour (all whole wheat) and they cooked up wonderfully!!! These are a winner, but you have to add the extra flour!! I had such trouble with making these. Your ingredient list and directions are a mess, at least to me they are. First, instead of starting with preheat to 375, you should add to do 350 for mini muffins, not at the end. I wanted to try doing it as mini ones but had it preheated at the wrong temp. It says to mix dry ingredients together, so I added the sugar on first attempt to them read the next step that the sugar goes with the wet. And is the butter suppose to be soft or not? It didn’t say so I put it in cold and was really hard to mix in smoothly. Then it says to add produce and apple juice and apple sauce, well only produce listed is the carrots and the already purée, which I am assuming that step is to make the purée. You have the stuff listed in your post but not in the ingredients. But then also, are you suppose to add extra juice and apple sauce since that is in the list along with the purée? I got so frustrated while trying to make this. I still need to learn to read ahead before I do anything but as I am not a great baker, I also hope that recipes are well written and easy to understand. I am writing this as they are cooking, hoping they turn out alright. Love the idea of this, just I think I will need to play around with what I do with it to write one I can understand easier. Mend – thank you for your feedback! I went back and am implementing the changes you mentioned to make it an easier recipe to follow. Thanks! Hi there, I made these twice now. The first time they came out wonderfully. The second time I forgot my baking soda, and they came out very moist and mushy with baking thenm for 25 minutes, even the mini muffins. Can my toddler still safely eat the mushy muffins? Yes – they will be safe to eat if your toddler will eat them! I just wanted to mention that I totally cheated and used two packs of organic veggies squeezy packs instead of making the puree and the recipe was still awesome. Served them at my one year old’s birthday party yesterday and all the moms were shocked to see their kids gobbling up veggie muffins! Thanks! Hi, I love your recipes and am eager to try these. But given that you have cooked the veggies and then bake them, how much fiber/nutrition value are the vegetables and fruit once they have been cooked twice? This is more question then a criticism of the recipe. Thanks. There is a little bit less nutrition – a lot of the produce used in these is fresh and overall these muffins are very nutrient dense. If you try it will all raw veggies – let us know how it turns out! We don’t have a book yet, but it is in our future plans! Thanks for this recipe! Some commenters were asking about gluten free, dairy free and egg free options and I have to say, I’ve made these with all 3 substitutes and they’ve always come out great! I use Namaste Gluten Free Perfect Flour Blend (from Costco) and you just have to sub 1:1 for the flour. For the dairy free, I use Soy Yogurt. Sometimes plain when I can find it, but I’ve used strawberry, lemon and blueberry and my son loves them all! For the egg substitute, I’ve used both Chia seed sub (1 tbsp chia seeds soaked in 3tbsp water, per egg, for 5-10min) and also used the 2 tbsp warm water, 1tbsp oil and 2 tsp baking powder per egg. They both come out well! Thanks for all the substitution ideas! Thanks for the substitution ideas – I was wondering about that since my son needs to avoid eggs and dairy. The rest of the ingredients sound great but what I am wondering is, how much / which part of the good stuff in these fruits and vegetables is lost by baking… Does anybody know? Are these Gluten Free and how many calories are in these? Had a really rough time with this recipe, which is frustrating because we’re trying to make healthy treats on a limited budget. You should consider updating the recipe so that beginner bakers like me who follow instructions to the letter wont run into similar problems. I’m so sorry you had trouble. I will definitely look at the recipe and see how we can make it more clear. Thanks for the feedback! i’m very disappointed that these muffins did not cook well in the middle! Even after following the recipe and not substituting any ingredients. Left them in longer in the oven but now the outside is hard! I wonder…if I need to make these muffins mostly dairy free, (butter is ok but not yogurt) maybe I could omit the apple juice and use dairy free milk? I have coconut milk and almond milk on hand. They look delicious and I am very excited to try them!! I think substituting the milk for the juice would work just fine. The yogurt adds moisture and protein, so you could substitute a dairy-free yogurt like coconut yogurt. I LOVE these muffins! I modified them a bit for a refined sugar-intolerant kiddo, and added pure maple syrup with a drop of honey, and then balanced the extra liquid with bran and ground flax. The kids keep asking for more – even my picky eater who ‘hates’ veggies! Thank you for sharing this awesome recipe! Hi! I finally decided I needed to leave you a comment. First of all I have made these muffins for my toddler numerous times! He loves them and it’s the only way to get veggies into him lately. The only things I change are I omit sugar and I use all whole wheat flour and he still loves them. I tell everyone I talk to about your website and this recipe. I have made a few other recipes from your site and all have been delicious and successful. Thank you!!! So glad! Thanks for letting us know. Hi. 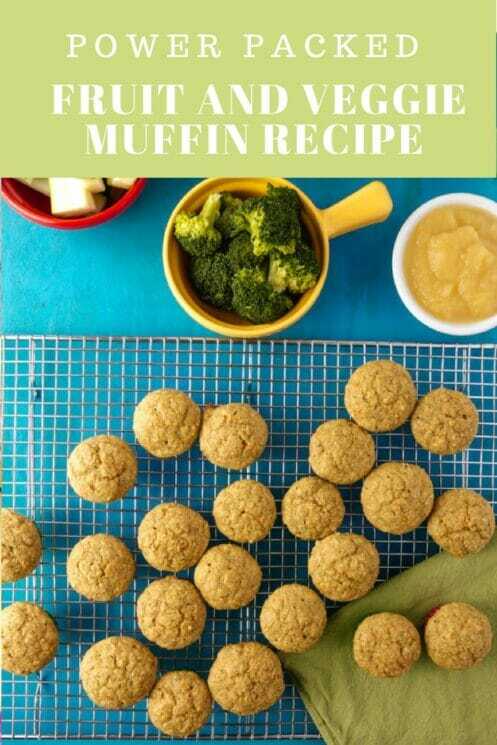 Would you happen to know how many servings of fruits/veggies these muffins have? Of course any amount of fruits/veggies is good for my 2 year old who would love to live on pizza and quesadillas! But I was just curious. Thank you! These muffins sound amazing — I will definitely try them! I like to cook and bake with what I have on hand, and it would help me a lot to know about how many cups of purées and shredded fruit and veggies you used. That way I can replace for what I have in the fridge and still not go overboard and end up with a mushy mess. Honestly I’m not sure how many cups of puree. Based on ingredients in the recipe, I would estimate 1 1/2 cups of the puree. Good luck to you! These muffins are fine, if you are into enriched flour and sugar, but PLEASE do not refer to these as “healthy”! Just because they contain veggies and fruits does not make them healthy. That’s like saying french fries are healthy because they are made with potatoes. Our message is to encourage families to consume more fruits and vegetables. We believe this has the greatest impact on overall health and really try to focus more on what we should be eating that what we shouldn’t. I couldn’t stay awake long enough to read all the comments, but I know there were issues with these not baking all the way through for some. I had that issue as well the first time I made these, and I had followed the recipe to a T. The next time, I eliminated the juice & applesauce, increased the baking time to 22 minutes and I used my convection function on my oven. THEY ARE PERFECT!! Great recipe, thank you!!! Loved the muffins! They are a bit too moist in the middle, so I’ll try mini muffins next time. I followed the recipe exactly, but added raisins and nuts the second time I made them to cut back a bit on the sugar. But your picture??? They look nothing like the pale “cupcake” in your illustration. 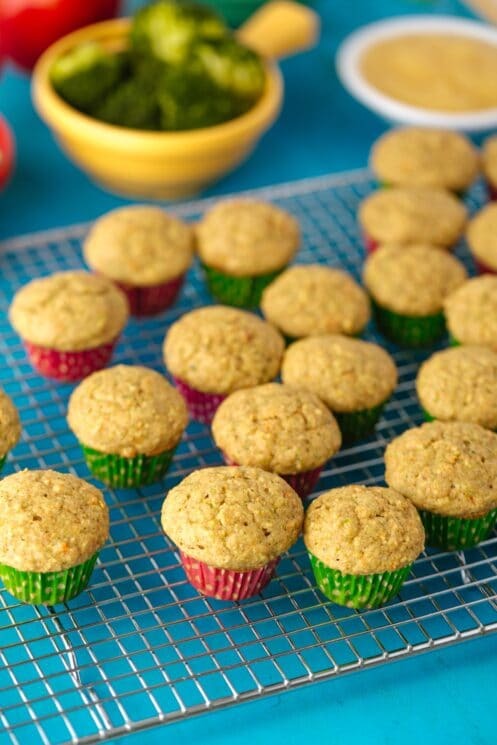 With all that zucchini, broccoli and whole wheat flour– they look like a bran muffin. The top really does not look very appetizing, so I like the sprinkle of oatmeal idea–I’ll try that next time. These muffins worked great for me! I made mini muffins, I substituted coconut oil for butter and a third of a cup of maple syrup for sugar. I also didn’t have apple juice so I used milk. Everything else was exactly the same. Cooking time was 19 minutes and with a sprayed muffin tin they came out super easily. When I make them again I will use a touch more maple syrup. Thanks for the recipe! Just made these this morning – my toddler has eaten SIX of them already! LOVE!!!! We followed it exactly as written – perfect! THANK YOU!!!!!!!! Yay! Thanks for the great feedback Holly! We are so glad your kiddo loved them! I was really hopeful about this recipe, and have never been more frustrated baking. I followed your recipe exactly with the same veggies and did mini muffins. Still after over 40 minutes of baking they would not cook through. I had to keep putting them back in to try to get them to bake, but after 40 minutes I had to stop trying because they were burning on the outside, yet still wet on the inside. I’m very disappointed, as I have wasted the ingredients and more importantly my time, which is something I have very little of. I’m just curious if you know the nutritional value per servings? My 2 year old loves these! Thank you, thank you, thank you! Is the nutritinal value accurate for these muffins. It seems quite low in sugar and carbs. Thank you. Loved the idea. All we could taste was broccoli. Bummer. Can the recipe be made using only whole wheat flour and no white all purpose? Thanks!! Can you make this with gluten free flours? My toddler, who cannot stand the sight of a single vegetable, can’t stop eating these. Granted I didn’t add the broccoli because I was afraid of it overwhelming the flavor, but now that he likes these, I may add it gradually. Perhaps at one point in his life he’ll just eat straight broccoli. Love these muffins – sweet, cinnamony and buttery. I’m so confused. These seem packed with fiber and other vitamins but the nutritional facts chart at the end of the Article state otherwise?! The macronutrients is what our info shows, and these muffins are packed with micronutrients 🙂 The nutritional info is for a mini muffin, and so sometimes the fiber does not calculate until it his 1gm per serving. i just done them and something went wrong! they are wet in the middle 🙁 i know I put dry to wet insted wet to dry. is that the reason why they wet inside even after 20 min in oven?? can the veg and fruits measurement be converted to cups? a medium banana from US might be a large banana from Asia. Omg these are yum I had no problem with the receipe at all I did mini muffins my LO who does not eat veg at all has literally asked for cake he’s eaten 7 already. Amazing muffins thank you so much! Awesome!!! Thanks for the feedback! Do I have to refrigerate these right away since it has egg and yogurt ? Also nutrition facts here say no fiber, but what about all the fruit and veggies? I followed the recipe almost exactly, except we did not have whole wheat flour so I doubled the all purpose flour. I made them as mini muffins and they turned out perfect! My 3 year old loves them and has no idea how healthy they are! Thanks for the great recipe! So great to hear – thanks for the feedback! Just wanted to confirm….for the broccoli florets and zucchini…is that measurement before cooked or after cooked? My 2.9 year old gobbles these down with a few changes. I add 1 tsp of cinnamon, 1/8 tsp of ginger and a dash of allspice. Also, I leave out the applesauce and put in a whole apple. Lately, these are all he eats! Thanks for the recipe! Whole family loved this recipe, including our very picky 2 year old granddaughter. I made mini muffins and froze some in a freezer bag. All were gone in a few days. I will be making more. Very easy to make too. Thanks for this recipe! You could replace with 1/2 cup silken tofu or yogurt. These muffins are great! I have one really picky eater, but does like most muffins and she approved 🙂 The only downside is that they take a little bit of work, so I think in the future I will make a double batch and freeze one, so I don’t have to make them as often. Why does the nutrional value information say 0 grams of fiber? Hit with my picky five year old. Holy! These muffins are yummy! I quickly had to pack them away so that we have some for the next couple of days at least. The combination of flavors is great with a very subtle hint of sweetness. Though the recipe itself is wonderful the instructions could be a lot more precise since baking is a science and things can quickly go sideways if the balance of ingredients is not there. Looking at this from the perspective of a novice baker, I would preheat my oven and prepare my bakeware first (I believe the instructions to do that is in the middle somewhere). The eggs and butter should be at room temperature because they incorporate much easier that way. Precise measurements for the zucchini, carrots and even the apple would make the recipe that much easier to replicate with consistent results. After following the recommended amounts, I decided to weigh my ingredients for ease next time and this is what I got: 92 grams of steamed zucchini that had been lightly blotted of excess water, 89 grams of apple, 155 grams of finely shredded carrots, and 1/2 cup of steamed broccoli florets as per the recipe. The yogurt should be specified in the recipe as greek yogurt (which is what they use in the recipe) because plain yogurt does have a lot more water than greek yogurt and that would alter your final results. My batter had a good consistency. I made mini muffins which I baked using the convection bake mode at 325 degrees for 15minutes. Perfect! Again, awesome recipe but the instructions need to be more precise to ensure much better results every time. I will definitely be making this again! Thanks for the feedback and the specifics! These were a hit with my crew! My 3 year old son is extremely picky and never eats veggies so these were a big win for us. Thanks so much for the great recipe. And your tips were so helpful! I would substitute spinach instead of the broccoli. The broccoli overpowers. The calories that is listed, is that for mini or regular sized muffins? I make the regular sized. Our family loves this recipe. I’ve made it twice now. I was nervous about there being too much liquid based on others reviews so I leave out the apple juice and yogurt. They come out great. Can these receipe be made with gluten free flour? 1 cup all purpose flour + half cup sugar = not healthy for kids at all. Once in a while it’s fine. But sugar shouldn’t be incorporated in a child’s diet unnecessarily. And why do we really need sugar when apples and bananas have the natural sweetness. Hi, is your “nutritional facts” box at the bottom of this page (fruit & veggie muffins) up to date? It lists fiber at 0 grams. And what is the serving size? One mini muffin, two? Can’t wait to try them! How does this have 0 fiber? Zucchini, carrots, and apple all have fiber. These were really lovely, Masters 4 & 3 gobbled them up! I didn’t add the broccoli because I didn’t have any but also because of what other’s said about it overpowering. I also didn’t have any apple juice or sauce so I substituted with pineapple juice & stewed pears that I had in the freezer. I will definitely be making these again. I don’t have a food processor. Can I puree the veggies in my Nutribullet instead? HI- I made these yesterday and added 1/4c cocoa powder to the dry ingredients and folded in 1c mini choc chips at the end and they came out perfect! Do you happen to know how many regular size muffins you can eat to equal a serving of fruit/vegetable? Thank you! Made these and they were fantastic! Will it still work if I double the recipe? Cooking for twins! How could there be zero fiber in these muffins with all those fruits and veggies? As mom I love these too! I’m wondering what the serving size is for my own calorie counting purposes. Do you think I would be able to shred the Zucchini instead of steaming it? I just made these and they turned out absolutely perfect. Followed the recipe exactly except I used coconut sugar instead but with the same amount. My kids can’t keep their hands off!! I used a mini muffin tin without the linings and I got 24 perfect pieces. Just made these and they taste good but trying to figure out why it came out so dense and not light and fluffy. Any ideas? I used my baby breeza to steam/blend and then poured the hot mixture in with the cold egg mixture. Could this be why? Thanks in advance!! Have you read through the other comments? There are lot of different factors that could alter the way the muffin turns out in this recipe. Just tried making these for the first time and they turned out fabulous! So good! I did add an extra 1/4 cup of flour for high altitude (5,600ft). I’ve found this helps with all my baked goods. I will definitely be making more. Thank you for this recipe! Great feedback! Thank you and I’m so glad you enjoyed them! – additional 1/2tsp. baking soda. – I sprinkled more cin/nutmeg/salt, nothing significant, just enough to offset the additional dry ingredients. Baked 375° / 20min. – Perfect! My 3yr old ate one muffin, and that’s enough of a win for me. Thank you so much for sharing!! I just made these tonight as per the recipe plus a little dash of baking powder, and no apple juice. I also added a bit more flour to the mix to thicken it up. They were really yummy! Baked for about 10 min at 350 and they were cooked perfectly. Made 48 mini muffins. Now to see if my 18 month old will eat them! ;). Thanks for sharing!! 1. Do you also steam the zucchini? Wow. These are just seriously yummy! Best muffins i have had! My 18 month old and I both love these! The test will be if my husband eats them too. I can’t taste any broccoli. They just taste like zucchini bread. Which is a little strange, I guess, since I subbed summer squash for the zucchini. Wonderful recipe! Is there another flour that can be used in place of the whole wheat? I made these today and they were AMAZING. I am confused about all of the negative reviews. I made them exactly as written – no issues at all. I had to cut my 2 yr old off from having any more b/c I want to freeze some! I ended up with 2 cups of the vegetable/fruit puree. Some other commenters have talked about 2.5 cups being the goal but I followed the recipe I ended up with 2 cups. If I had success with 2 cups, and others are having success with 2.5 cups – that just goes to show how forgiving this recipe is! I used a small muffin tin, no liners. I sprayed with a little oil. They came right out. Done after 17 min. I got 40 mini muffins. Next time I’ll add flax meal and cut back on the sugar a tiny bit. These are so goooood and I hate banana! Hi, what is considered a serving for your nutritional values chart? 1 regular muffin or 2 mini muffins. I’ve made these before and my son loved them! Now im going to be making them for my grandparents who have Dimensia and are not eating enough healthy food. It’s amazing how similar they are to my toddler now! Fingers crossed they like them too! I just made these and my 1 and 5 year old devoured them. Delicious! They helped make them and I was sceptical with all of the veggies that went in that they would eat them at all. This will be a new staple at our house. Thank you so much for the great recipe. That is SO great to hear about these muffins! These turned out amazing! So good followed recipe to a T I think walnuts would also be great in these! Is there a possible substitute for the yogurt? Kiddos belly can’t tolerate yogurt. You could add more applesauce or a soft tofu. These were super yummy- liked by myself and my kids! I actually had to tell me son to stop eating them ? Recipe was easy to follow and I will definitely use it again. These are so great! Any suggestion for substitution for banana? Can I substitute coconut oil instead of butter for my dairy allergy kiddo? Sure! You can sub coconut oil in these. Any substitutions for banana? My son can’t have it. Applesauce could work as a substitute. Thank you!!!! We’ve tried it so many times because we want it to work for everyone!! Got bored with all the adjectives (how many times can you use “super” in 30 seconds?) I’m so bored, board, bow/errs. Thanks for the editorial advice! Our power packed fruit and veggie muffin recipe for picky eaters are so good that we feel like the word super needs to be included a lot! My two and half year old grandson cannot wait to make the veggie muffins (banana, carrot and apple variation). He knows the recipe so well that he now takes most of the ingredients out of my cupboards, including two eggs and places them on the worktop ready to use…. From a very happy Granny! These turned out amazing! It’s very helpful to read the blog post with this recipe. A lot of helpful tips so that turn out. My extremely picky 2 year old loves them! I steamed and puréed the carrots with the rest of the veggies just because my toddler is very particular about texture. I also substituted the Greek yogurt for silk almondmilk yogurt alternative because my little one doesn’t tolerate yogurt well. They are a dense muffin and initially a little too moist just out of the oven but perfect after sitting overnight! A must for picky eaters?? These were delicious and perfect day one, light and fluffy. But by morning, they had fallen flat and texture wise were rejected by my picky eater. Any ideas why they would deflate over night? Thanks! How did you store them? Can I use coconut flour or some other kind of flour instead or will that alter the baking times? I make these ALL the time for my very picky 4 1/2 yr old. I use coconut oil instead of butter, and coconut water instead of apple juice. I even added butternut squash to a batch yesterday. I freeze them and use them for snacks. Thanks so much or this awesome recipe! I have no idea how to bake and really want to try these muffins. I’m in Australia so want to make sure there isn’t anything I’m missing in translation (so to speak). 1. The flour ingredients is either self raising or both? Hi Nikki, you do not need self-rising flour and those choices of sugar are all ok. Enjoy! This sounds amazing and I can’t wait to try for my picky eater! However, my 2 year old is allergic to dairy, can I substitute with soy or coconut yogurt? Marigold, it should be OK to use soy or coconut yogurt. Enjoy! I love this recipe, but want more protein in it. Would you be able to suggest modifications for adding a scoop of protein powder to the recipe (22g protein)? Should I add more “wet” ingredients to balance out the texture? You can actually replace some of the flour in the recipe with protein powder. Just make sure you aren’t substituting more than 50% (at the very most) Protein powder can make baked goods brown faster so you will need to watch them a little closer. MY picky eater loves these. I have used the ingredients above and I have also substitute with green beans instead of zucchini and broccoli. Still turned out great. Thanks for the positive review and also the substitute tip! Thank you for posting this. My picky eater said mmmm after trying it. Has anyone tried making these using jarred baby food? I have a bunch of flavors I need to use up! So I read where you said they are packed with fiber which I would think so considering all the fruit and veggies as well if you use whole wheat flour but the nutrition facts show 0 under fiber? Thanks for pointing this out. The correct information is update. We hope you enjoy these! What would be the best wheat flour substitute for a GF family? I saw the link in the other comment but wanted you opinion on which option would be best substitute for this recipe and in what quantity. Thanks!! These are so good! My 2 1/2 asked for another after eating her first! Thank you for the recipe!! Love this Ashley! Thanks for sharing. Hi. I was just wondering if blending the carrot too should it be cooked first? Hi Betty, the recipe calls for the carrots to be raw, and shredded. 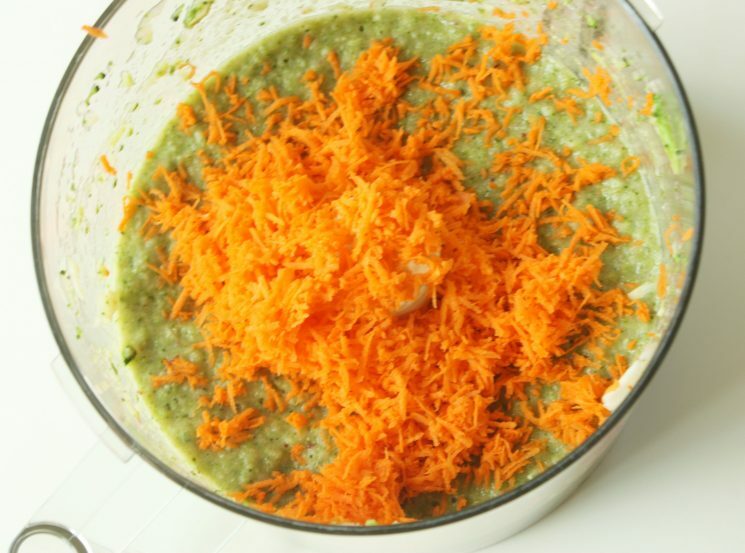 About how many cups of zucchini and carrot does this recipe call for? I’m using pre-spiraled veggies so it’s hard to judge…thanks! These are the first things with veggies my daughter will eat. I just made them for the 5th time and always have them on hand in the freeze for hunger strike days. My daughter is dairy intolerant, so I substitute the butter for veggie alternative, but next time I will try coconut oil, and I am going to try maple syrup instead of sugar. I use water instead of apple juice and coconut yougurt instead of greek yougurt. I am so happy to have found this recipe. my boys love these muffins. I don’t know how many times I have made them now but they always come out perfect! What I find is that when muffins don’t turn out it is usually due to the mix being over processed. Don’t mix it too much at the end, just mix it enough to get the ingredients together. If mixed too much you will get flat muffins. How many carrots should I use if I’m using baby carrots? Hi Brittney, I would try six or seven baby carrots to approximate the amount called for in the recipe. I hope this helps! When you say half a cup of broccoli florets is that steamed or unsteamed (they shrink a bit on steaming). Thanks! Excited to make these. What is the best way to store these for the week. I made a weeks worth for my sons lunches. Is fridge ok? Hi Krystle, I think the fridge would be OK for a school-week. These muffins freeze well, too. We like to keep some in the freezer and move one or two to the refrigerator to defrost the night before we plan to serve. This is a winner with my 3 yo who barely eats vegetables. And the recipe is surprisingly flexible – I’ve had success with varying the veggies, fruits, flours, and muffin size. Thank you for an awesome snack!